After celebrating their 40th Anniversary in style last year, X are setting their sights on the next decade with a slew of new tour dates, quickly filling their 41st year. Stops will be up down the west coast and many more places beyond, all to be announced soon! 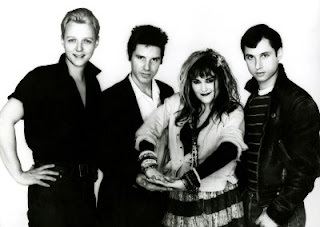 X's four original members - Exene Cervenka, John Doe, Billy Zoom, and DJ Bonebrake - quickly established the band as one of the best in the first wave of L.A.'s flourishing punk scene. Last year the quartet celebrated its 40th year in music when X: 40 Years of Punk in Los Angeles was unveiled at the Grammy Museum last October and held court on the second floor of the museum until just this last weekend. The exhibit will now travel to Tulsa where it will be on display at the Grammy Museum there, this summer. In a very special moment for the band last fall, they had the chance to celebrate with the red-hot L.A. Dodgers, where Exene threw out the first pitch and John Doe sang the National Anthem at one of Dodgers' record-breaking season game winners. 1977, X quickly established themselves as one of the best bands in the first wave of LA's flourishing punk scene; becoming legendary leaders of a punk generation. Featuring vocalist Exene Cervenka, vocalist/bassist John Doe, guitarist Billy Zoom, and drummer DJ Bonebrake, their debut 45 was released on the seminal Dangerhouse label in 1978, followed by seven studio albums released from 1980-1993. Over the years, the band has released several critically acclaimed albums, topped the musical charts with regularity and performed their iconic hits on top television shows such as Letterman and American Bandstand. X's first two studio albums, Los Angeles and Wild Gift are ranked by Rolling Stone among the top 500 greatest albums of all time. The band continues to tour with the original line-up of John Doe, Exene Cervenka, Billy Zoom, and D.J. Bonebrake.